Includes shirt, pants, sash, bandanna and cuffs. COSTUME CONSISTS OF ROYAL BLUE SATIN FABRIC TOP WITH RED TRIM AND WHITE LACE AND COORDINATING SKIRT. SKIRT FLARES OPEN 180 DEGREES. COMES WITH RED WAIST SASH. SIZING IS TRUE TO AVERAGE CHILD AGE. 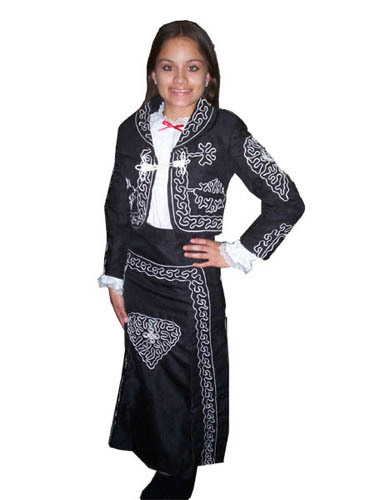 AUTHENTIC MEXICAN JACKET AND SKIRT FOR CULTURAL PARTIES AND EVENTS. WHITE SHIRT NOT INCLUDED. 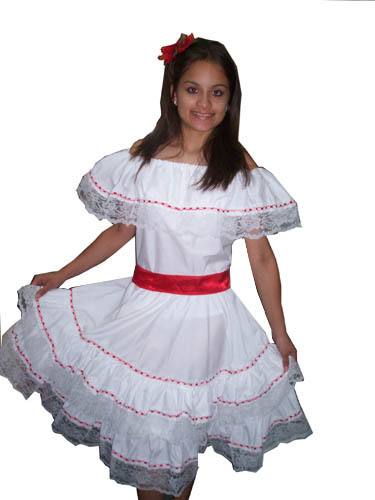 TRADITIONAL COSTUME INCLUDES: OFF SHOULDER WHITE BLOUSE WITH LACE TRIM AND BLACK SKIRT WITH COORDINATING LACE TRIM. NOTE COSTUME SIZING IS TRUE TO CHILD SIZE. SHOES AND ACCESSORIES SOLD SEPARATELY. 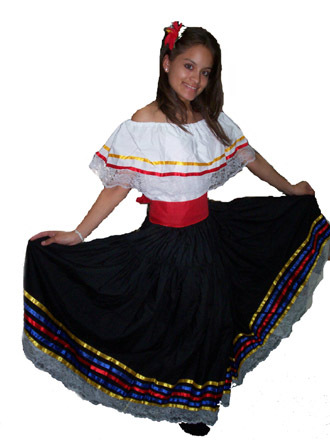 TRADITIONAL ATTIRE WORN FOR FESTIVALS BY THE COLOMBIAN WOMEN CONSISTS OF FULL FLARED BLACK SKIRT WITH RIBBON AND LACE TRIM AND WHITE OFF SHOULDER TOP WITH LACE TRIM. RED WAIST SASH INCLUDED. 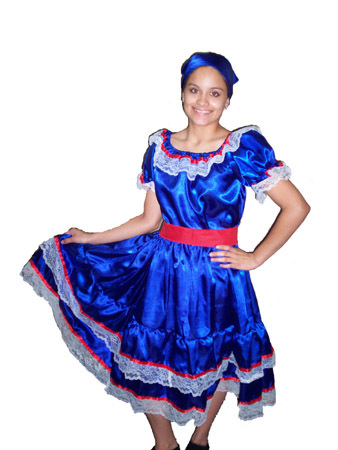 ATTIRE USED FOR CARNAVAL, DANCE AND EVENTS TO REPRESENT THE DOMINICAN REPUBLIC. 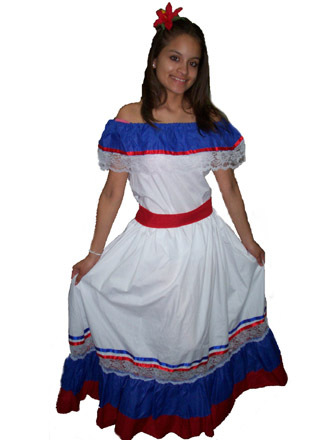 CONSISTS OF WHITE OFF SHOULDER COTTON BLOUSE AND COORDINATING SKIRT WITH RED WAIST SASH. 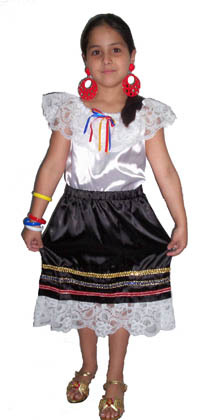 Dress your child as a Dominican in this costume that includes blouse, skirt with flowers and sash. 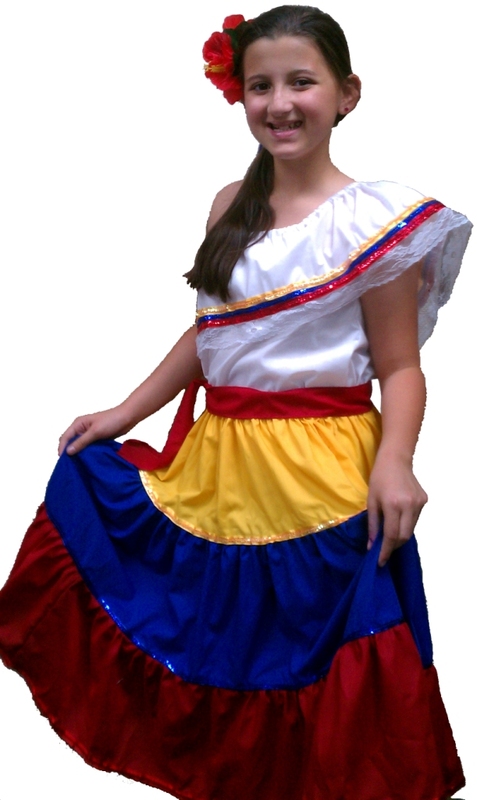 REGIONAL DANCE WEAR FOR EL SALVADOR. OUTFIT CONSISTS OF OFF SHOULDER BLUE SATIN TOP WITH LACE AND RIBBON TRIM AND COORDINATING FLARE SKIRT, BLUE HEADBAND AND RED WAIST SASH INCLUDED. 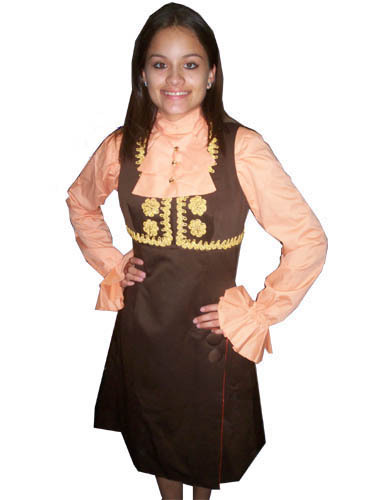 HIGH SOCIETY EUROPEAN EPOQUE COSTUME INCLUDES VINTAGE EUROPEAN DRESS WITH PEACH BLOUSE. 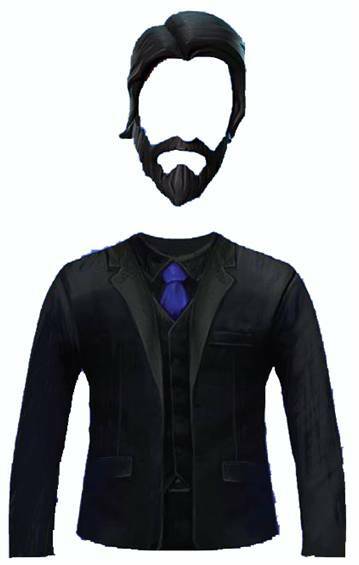 DELUXE QUALITY COSTUME. ONLY SIZE SMALL AVAILABLE. 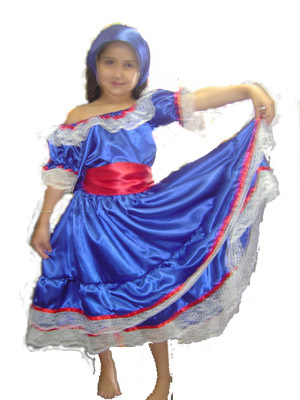 TRADITIONAL SATIN GOWN WORN IN FESTIVITIES, SOCIAL GATHERINGS AND CUBAN HERITAGE AND CULTURAL EVENTS. INCLUDES FLOWER HEADPIECE. COSTUME CONSISTS OF ROYAL BLUE SATIN FABRIC TOP WITH RED TRIM AND WHITE LACE AND COORDINATING SKIRT. SKIRT FLARES OPEN 180 DEGREES. 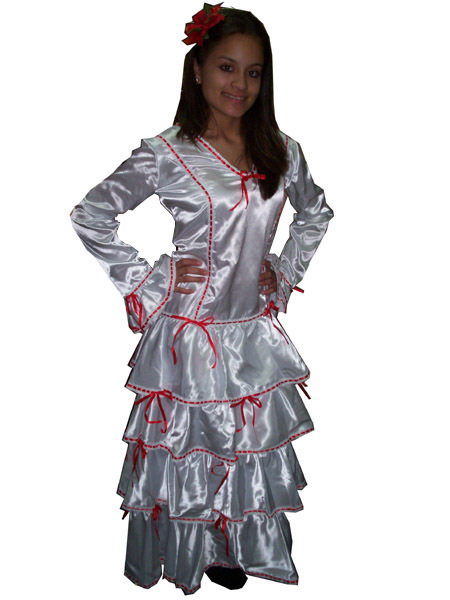 OUTFIT INCLUDES "POLLERA" STYLE BLOUSE WITH RIBBON TRIM AND COORDINATING SKIRT. 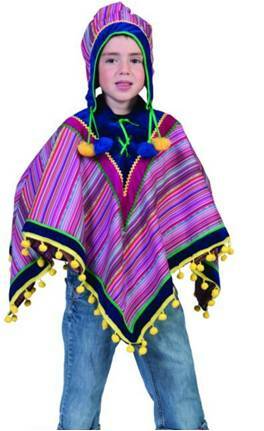 Dress your child in authentic Peruvian attire in this poncho and hat. 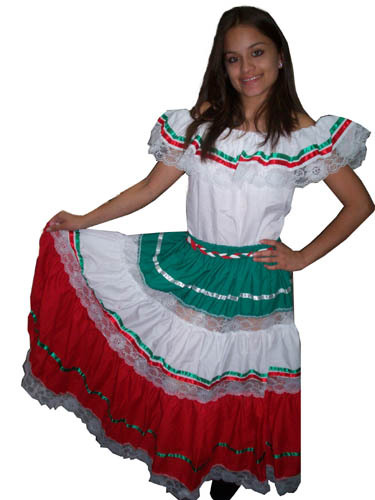 TRADITIONAL MEXICAN GIRL REGIONAL ATTIRE USED FOR DANCING AND CULTURAL EVENTS. 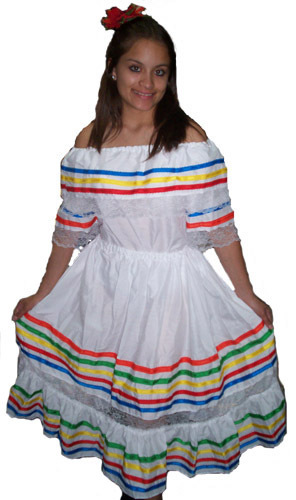 INCLUDES OFF SHOULDER BLOUSE, TRI-COLORED SKIRT AND WAIST PIECE. OPTIONAL FLOWER HAIR ACCESSORY SOLD SEPARATELY. ALSO AVAILABLE IN CHILD SIZE. REGIONAL ARGENTINIAN ATTIRE. RED/WHITE/BLACK SATIN. OUTFIT INCLUDES BLOUSE WITH LACE TRIM, SKIRT, AND RED WAIST SASH. FLOWER HEADPIECE SOLD SEPARATELY. 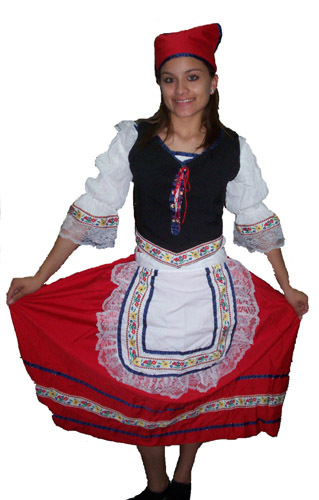 TRADITIONAL ATTIRE USED IN DIVERSE EUROPEAN COUNTRIES. 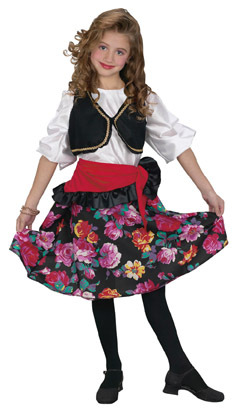 INCLUDES PEASANT BLOUSE, BLACK VEST WITH FLOWERED TRIM, RED SKIRT WITH TRIM, APRON AND HEADBAND. CONSISTS OF WHITE COTTON DRESS WITH AMPLE FLAIRING SKIRT AND TOP WITH RIBBON TRIM. FLOWER HEADPIECE SOLD SEPARATELY. Includes a top, sash and skirt. STYLES MAY VARY. INCLUDES TOP AND DRESS. Costume features hooded robe, sweater, dickey and necktie.